As the process technology provider of the Orda Glass float glass manufacturing and processing plant in Kyzylorda, Kazakhstan, Stewart Engineers, Inc. is pleased to announce float glass advances - Installation of production equipment support steel structures is advancing. 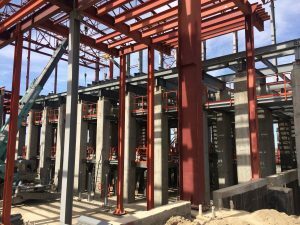 The installation crew on site in Kyzylorda, under the supervision of Stewart Engineers, is ramping up the installation of support steel structures for the tin bath and melting furnace of the Kyzylorda float glass plant. Support steel installation commenced in early March. Nearly 80% of the support steel installation is expected to be complete as early as July. At that time, sufficient steel will be in place to begin installation of the melting furnace and tin bath, which comprise the heart of the float glass production line. It is critical, however, that a new construction company be appointed shortly to continue the civil works, as the melting furnace and tin bath cannot be installed until civil construction is sufficiently advanced. The batch plant (for mixing of glass-forming ingredients) must also be completed in order to commence heat up of the melting furnace. "Stewart Engineers is delighted that work continues forward, and we applaud the efforts of our partner Orda Glass Ltd. LLP in searching for a new civil works construction company to fulfill Orda's civil works responsibilities in this project," advised Stewart Engineers' Vice President of Technology, Chris Cording. "Stewart Engineers is assisting Orda in this initiative. China Triumph International Engineering, a well-known float glass factory construction company is currently in negotiations to take over the civil works from the previous contractor ShymkentKhimMontazh."